Design your own layout & send us a file. Multiple colors, and brand color matching. Did you know you can completely customize your asset labels? To simplify ordering asset labels for everybody, Alliance provides a concise array of basic options to customize an order. From standard colors, sizes and shapes to standard layouts and content, these choices satisfy the vast majority of customers. But your options are unlimited. At Alliance we’re passionate about asset labels of all sorts. Since 1984 we’ve aggressively expanded our capabilities — exploring new techniques and adapting to vital new needs. Every day, military, government, industrial and institutional organizations demand solutions to complex, real-world issues. 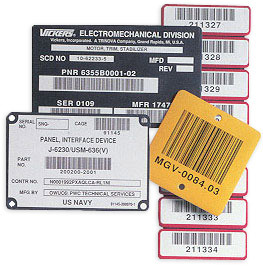 Among the many products that we ship are warehouse labels, unique identification tags, environmental regulatory compliance labels and teflon-coated barcode tags. From rigorous technical specifications we create elegant products. So when customers want to customize their asset labels, we make it easy! Usually a simple phone call is all it takes. Tell us your needs, fax or email documents, or we’ll tap into our extensive resources to determine the requirements. Then we crank out a proof for you to review. 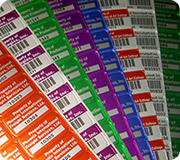 Once the layout is approved your asset labels are swiftly produced and delivered to you. How would you like to customize your asset labels? Once again, anything is possible, but the tag material plays an important part. Metal labels made from aluminum must be die cut. If we don’t have a die in our collection which matches your specs we’ll have one made. Polyester and vinyl labels of unique shape and dimensions are significantly easier. For these flexible materials we’ll often use a precision cutting laser with instructions from a vector-based digital file. We pride ourselves in finding an optimal balance between high quality and the most cost-effective solution. Choose from a wide gamut. Show us your logo or brand colors. Specify Pantone (PMS) colors. Send us CMYK or RGB values. Or show us a color somewhere that you like. We’ll print metallic or fluorescent colors, smooth blends or photographic images. Labelling your assets reinforces your brand, so it’s natural to incorporate your logo into your property tags. We work with a wide variety of common file formats to produce accurate prints of your logo or artwork. You can also send us the entire label layout as a file and we’ll print it on the substrate of your choice. We have a vast library of typefaces we employ on a regular basis. If you have a special font we’d be happy to use it on your asset labels. Most labels sport at least one number by default. Add more numbers to represent departments, sections or other classifications. 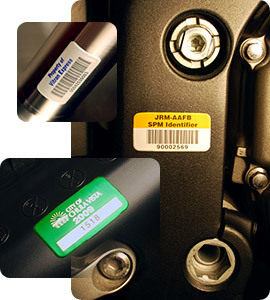 Feature multiple barcodes for different tracking systems or procedures. Include blank fields for markings. We can also produce variable data from your defined sequence, or from a data file. You’d be surprised to discover that most of these customizations won’t cost anything extra. We’ve found that making customers happy if the best business practice. 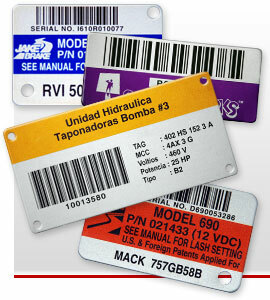 In our quarter century of manufacturing tags and labels, most of our customers return again and again. Give us a call at 858.549.7297 and we’ll help you fnd your perfect solution!